There’s something special about the bus I take to and from Vancouver. It’s not magic or double decker; instead, it can go back in time. The reason I say this is because quite often I see someone I haven’t seen for a while on the bus. Having always lived elsewhere since high school, the rare occasions I come home usually allow me to bump into someone and have a good chat catching up while the bus rumbles along the highway. Yesterday I bumped into my friend Devin, and we had a nice chat down memory lane. I’m also fascinated by how well our mind works to recognize people after so long. Devin looks quite different now than when I last saw him, and yet somehow I was able to recognize him quite easily. It’s great to hear about what everyone is up to. Kind of like taking a bus ride into their lives, stopping at the major events and moving on to the next. 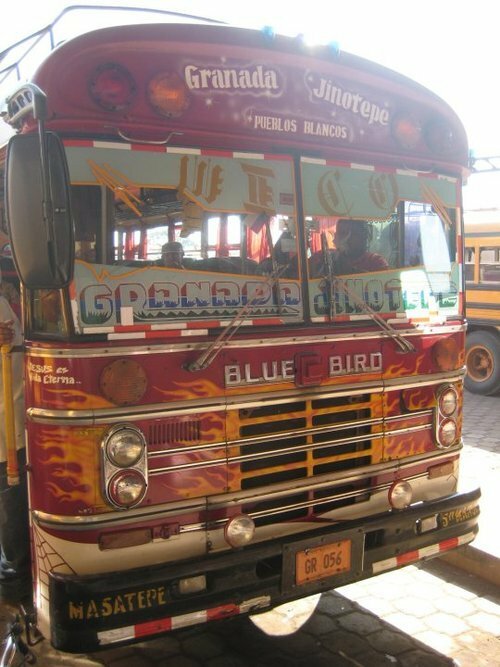 For you keeners, I realize that the Totoro Catbus does not go back in time, but it does provide a bit of magic, and I was never into the Magic School Bus (though I have taken this bus in Toronto a few times and the below decked out bus when I was in Nicaragua). It makes me look forward to taking that bus, never knowing whose path I’ll cross, and where this bus will take me today.